We have been getting a lot of companies come to us for geocoding services lately. What is geocoding? Essentially it is generating accurate coordinates for a location or street address. This can be really important if the locations are used in a GPS based device and especially where routing or directions are involved. For example it is often not practical for vehicles to zigzag from one side of the road to another. It may be impossible because of median barriers, difficult because of heavy traffic, or the vehicle could be one that must stay on one side of the road, for example a rubbish truck. Another classic situation would be where the address is given as Corner of X and Y Streets. That could be any one of four or more corners, which could have significant implications on routing and another time waster for people on the road. GeoSmart has driven most roads to sub half a meter accuracy which means that when we provide coordinates they will be on the correct side of the road. We have seen frequent examples of map providers who use source maps which are not spatially accurate, which can often result in the road being displaced to the point that both odd and even numbers are shown as being on the wrong side of the road. We have a number of services on offer. We have API’s which allow an application to look up addresses using an auto-completer. This is particularly good for accounting software, CRM and other applications, allowing companies to get the full information correct first time, right into the application. We never cease to be amazed at how bad some companies record keeping of addresses is for their clients. This may not be a problem when the same person calls on them for years, but when change happens, it can become a major time waster, especially in a country with so many duplicate place names. Go to http://www.aamaps.co.nz and see how many instances of Queen Street there are just in Auckland City! We have a geocode web service and also a Software as a Service (SaaS) application which allows you to upload a CSV file of addresses. It will resolve them including looking at incorrect spelling, vanity (e.g. where someone says Remuera, but technically they are in Newmarket) or incorrect suburbs and much more. The results include Post Code ane even Census data such as Mesh Block and the ability to export to GIS in MapInfo format.Results are ranked based on the result, for example if you look for 21A X Street and we don’t have 21A, but we do have 21 X Street, it will show as a sub 100% result and an explanation that we believe that result is correct. The same if a name is misspelled or perhaps it was entered as 21 X Street when it should have been 21 X Avenue. 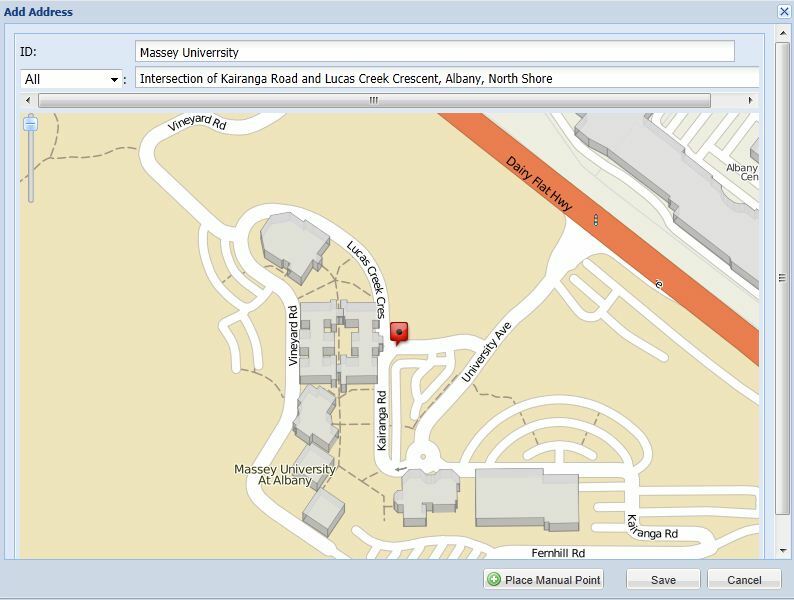 The application also allows you to modify the location by moving an icon on the map yourself. For example a property may have multiple entrances, or the location may not even be on a street. It could be a building in a park, or a location within a large complex such as a hospital, university or shopping mall. We offer the flexibility of doing it yourself and being able to interpret it yourself according to your needs, without requiring GIS software or skills. Having driven pretty much every road in New Zealand with our mapping car in most cases to sub 1 meter accuracy, we are able to offer a degree of quality not available anywhere else. In addition to a very attractive pricing model, we are a local company in your time zone, we have developers that you can talk to and are very passionate about all things location. To top it off, we are a wholly owned subsidiary of the New Zealand Automobile Association which is of course committed to New Zealand motorists and all revenues are retained in New Zealand. Want to know more. Why not contact us and be pleasantly surprised about how easy it is to use and of course affordable. P.S. We can offer the same services for Australia.